P90X Plus is an add on program for P90X. P90X Plus comes with 4 DVDs that have 5 workouts on them and a fitness guide. A big difference between P90X+ and P90X is the length of the workouts. P90X workouts were all (except abs) approx. an hour long (Yoga X is 90 minutes!). P90X+ workouts all clock in at 45 minutes or less. P90X+ is created and led by P90X trainer Tony Horton. 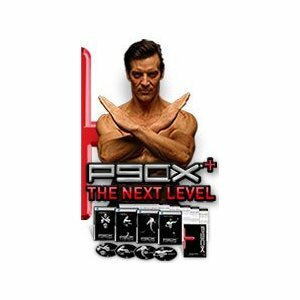 P90X+ is touted as “The Next Level–for P90X Grads.” Is it “the next level”? Hmmmm…. Not really. They are great workouts (most of them), but I wouldn’t call it “the next level.” Is it specifically for P90X grads? Yes. For various reasons. 1. If you did P90X then you already have all of the equipment needed and you also know how to use it. I say this because P90X has a lot of pull ups. If you do not have a pull up bar then you can use a resistance band secured in a doorway. This is shown in every P90X workout that has pull ups. P90X Plus Upper Body, Total Body and Abs/Core workout all use a pull up bar–but show zero modification if you don’t have one. But if you’ve already done P90X, then you know just what to do. 2. If you are basing all of your workouts on P90X, then yes, you need to start mixing it up and doing different workouts. P90X Plus gives you new ways to create muscle confusion and avoid muscle memory. 3. P90X workouts are pretty long–P90X Plus workouts are shorter. So if you don’t have the hour+ to do a regular P90X workout–pop in P90X Plus! 4. Finally, and this one goes back to time constraints, if you don’t have the time that week to do the muscle splits that P90X is set up with, you can do P90X Plus Total Body and knock it all out at once. Or you can do Upper Body Plus and get all your upper body work done in one workout, rather than doing chest and back one day, and shoulders, biceps and triceps another–which is how P90X does it. P90X Plus comes with a small booklet—nowhere near the quality of the P90X materials, but then the idea is that you are just adding onto P90X, so not a big deal. The booklet contains a short summary of each workout and workout schedules that incorporate the P90X+ workouts into the different P90X workout schedules (Classic, Lean and Doubles). Interval X is a cardio interval workout. It is 42 minutes long; 6 minute warm up, 33 minute training period and 3 minute cool down/stretch. Though I generally prefer my workouts to be around an hour, I still love this one. The P90X+ collection was given to me as a gift, but I put it on my gift wishlist primarily for this workout. I feel that P90X’s biggest weakness is its cardio, so it was my hope that this was a cure for that. And it is! Tony uses an interesting structure for his intervals. Each move has 3 levels of intensity. Each move is done for one minute, 20 seconds at each level. Unless they are moves that focus on one side of the body, then they are done 30 seconds on each side of the body (in 10 second level increments). Once you get into the workout, you become grateful for the levels of intensity. That 20 seconds of low intensity at the beginning of each moves becomes a nice little recovery period. I will say this is not the most intense interval workout I’ve done. But it is still a good one. It does the job, and it is interesting and different from other cardio workouts. Because of its length, I combine it with another, shorter, workout. When I did Interval X this morning, I also did ChaLean Extreme’s Recharge (21 minutes). So a nice long yoga stretch. Abs/Core Plus is also on this DVD and it clocks in at 20 minutes, so it is another way to get your workout up to an hour. Kenpo Cardio is a 41:30 minute kickbox cardio workout; 6 minute warm up, 33 minute training time and 2:30 minute cool down/stretch. I was really looking forward to this workout because I love Kenpo X from P90X–but it is not intense enough to be used in my regular rotation. I use Kenpo X as a recovery workout. So I was hoping Kenpo Cardio would be a more intense version. It is…. kind of. It is definitely fast paced, but it just doesn’t flow and some of the combos are awkward. Not a great workout, but it is decent. The warm up starts with about 1 minute of light cardio then moves into yoga. The training period consists of 3 circuits each done twice for a total of 6. Each circuit has punch/kick/block combo drills that are 30 seconds long–except for the last drill in each circuit which is approx. 60 seconds. Between each circuit is a one minute cardio break that has jump rope, jumping jacks and a twist block. It’s a decent workout but not one I will come back to often. Interval X is much better if you’re looking for a short cardio workout. Upper Body Plus is a 41 minute strength workout; 5 minute warm up, 33 minute training period and 3 minute stretch. Upper Body Plus is an excellent upper body strength workout. It’s set up circuit fashion with 4 circuits with a 30 second break between each circuit. Each circuit contains 5 moves, one for each body part: chest, back, shoulders, biceps and triceps. I felt that Tony hit every muscle pretty hard. The chest and back are primarily worked with pulls ups and push ups. No one uses the bands as a substitute for the pull up bar; however, if you’ve done P90X (which P90X+ assumes you have), then you know how that works. The male lead uses the bands rather than dumbbells for the other strength moves. The workout contains many interesting exercises–some were new to me and others are twists on ones I’m familiar with. It was a unique and intense strength workout. The circuits are fast paced, so I got something of an aerobic workout, too. 4th Circuit: iso climber push up, clear to negative pull ups, shoulder everything (4 shoulder moves done consecutively), bicep everything (4 different bicep curls done consecutively), combat push up. Total Body Plus is a 45:30 minute strength workout; 9:30 warm up, 31:30 training period and 4:30 cool down/stretch. I have some mixed feelings about this workout, so let me start by saying that it is a very good total body strength workout. Also, it is fast paced and filled with compound moves, so there is definitely a cardio component to this workout. Now that that the positive is out of the way, lets get to my nitpicks. I didn’t care for this workout. I mentioned that there were a lot of compound moves in this workout. In general, I don’t have a problem with compound moves–but the ones in Total Body Plus were often odd and awkward. I’ve read a lot of reviews for P90X in which people don’t like Tony Horton. He has never bothered me. He’s definitely not my favorite trainer, but his workouts are good and he doesn’t irritate me like he does other people. Until this workout, that is. In Upper Body Plus, there were some sales pitches for his push up stands and the SelectTech weights going on–but nothing major. Total Body is like an infomercial for his push up stands and to a lesser degree the SelectTechs. It was very irritating. And finally, P90X has a lot of pull ups, but in every workout with pull ups there is a modifier in case you don’t have a pull up bar. There is no modifier in any of the P90X+ workouts. In Upper Body Plus that’s not a big deal. If you’ve done P90X, then you know how to modify the pull ups. It is a bit of a problem with Core Plus, but not a major problem. In Total Body Plus, half of the pull up moves cannot be modified with the band–they were combination pull up/core moves. Core Plus had core moves on the pull up bar with no pull ups–so you could just do the move on the floor. Granted, not as effective, but you are still getting the core work. No way you can do the core moves on the floor and the pull up move with the band. Impossible. So I just did the “band” pulls ups. So those are my gripes. I did feel like I got a good workout, in spite of my complaints, but I didn’t enjoy the workout enough to come back to it again. Total Body is not done circuit fashion. You do 10 exercises, take a 30 second break, then do 11 more exercises before the cool down/stretch. Also the warm up is actually full of effective strength moves–push ups, lunges, squats, standing core work and more. So even though it is labeled a “warm up,” your strength workout starts in your warm up. On to the moves. One last comment before moving on. Total Body seems like it is trying to build on Core Synergistics from P90X, which is one of my favorite P90X workouts. Creating more complicated and complex compound moves does not necessarily make for a better workout–espcially if those moves are just awkward. I prefer the original, personally. Abs/Core is a 20 minute ab/core workout. I really liked this workout even though I don’t think it is as intense as Ab Ripper X. It’s still effective and fun. I probably like it better because it is so varied. You basically do 5 circuits of ab/core work. Each circuit has 4 moves in it. The first move is done on a pull up bar, the second move is done standing (and often incorporates hand weights), the third move is done in a plank or table or even down dog position and the fourth move is always in supine position on the floor. I really enjoyed it. Though Tony shows no substitute moves if you don’t have a pull up bar, you can do the moves that are done on the pull up bar on the floor on you back. Summary: P90X Plus was a mixed bag. I love Interval X and Upper Body Plus. I like Abs/Core enough that it will frequently be used in conjunction with Interval X and Upper Body Plus. However, I will probably never do Kenpo Cardio or Total Body Plus again. I didn’t like either of them. Is P90X Plus worth the expense? If you can find P90X Plus used for a good price, then yes. But the $60 Beachbody charges for it (it’s going for $70 on Amazon! )–No way, definitely not worth it. Save your money and buy better workouts. Anything by Cathe is a much better value. I just found your website today at the library and I’ve been on for about 3 hours now! First I hope your struggle with cancer goes well. Glad you’re still motivated and seem upbeat. Second, I have been doing my own rotation of Total body (p90 and body beast back and forth as follows, simply Total BodyX+, Cardio, Total Body (BB) Cardio. Thinking of switching to something like Upper Plus, IntervalX+,Upper Plus. Hello Beastling! This is the right place! If your focus is to lose weight, then total body strength workouts should be your focus. Heavier weights can help you cut your body/muscles (with proper diet, of course) but anyway who is trying to lose weight needs to focus on total body strength workouts alternated with cardio–and some of that cardio should be HIIT level. That is the best workout recipe for weight loss. I love these reviews. It’s nice to read thorough reviews of various fitness-related products by a person without a shamelessly shilling motive in their endeavours. thanks! I’m glad you find them helpful! Just finished my first 12 weeks of P90X and really enjoyed it, and made great progress. Thank you for your reviews. Question: I want something similar to P90X, so what from Cathe would you suggest? My only problems with P90X is- I’m using bands instead of pull-ups and I’ve pulled my hamstring twice during the “recovery” weeks. To many lunges for an old man (49). Congrats! P90X is a tough program! One day I will go through it again (for a 3rd time!) and finally review it.It’s going to be hard to find any lower body workouts that don’t include lunges; however Cathe’s Low Impact Series workouts are easier on the joints. Her Total Body Trisets is a great workout (it’s part of the Low Impact Series). I can also see how workouts like Plyo X would be brutal on knees. An intense workout that isn’t hard on the joints and doesn’t require a lot of equipment is Cathe’s Afterburn. As for heavier strength series workouts by Cathe, there is Burnsets–but that has no lower body work, just upper body. Gym Styles is 3 workouts that hit the whole body and are relatively heavy lifting. The strength work in 4 Day Split is as well, and finally STS. STS is the very best strength series out there–far better than P90X. It is equipment heavy and does require pull ups, you’d have to substitue with a band again (or do what I did and used my chest press/squat rack as a modified pull up bar). It doesn’t contain any cardio and you would have to modify some of the lower body strength moves if you have joint problems as she does do lunges. And finally, if you do choose STS, mesocycle 3 comes with Plyo Legs, which would be hard on bad knees, so get Squat Rack Legs which contains no plyometrics (it is to be used with meso 3 in place of plyo legs). And for any cardio by Cathe look for “low impact” in the title. Those do not require jumping and are more metabolic–so much easier on the joints. Good luck and, if you try any of these, let me know how it works out!